New competition? HoH-yeah! Watch it play out LIVE Thursday, July 13th around 10PM ET on CBS All Access with a FREE trial. Cody says when he goes back to Dallas he’s only got 1 good friends “that I trust” and that friend is gone so he’ll be solo for awhile. Kevin asks if he’ll be going back to work soon. Kevin – The only things that make you lose control is Money, Power, love, drugs, alcohol and gambling. Alex says the other side are all cowards. Cody – wait until you hear what I’m f*ing saying out there..
Kevin comes back “it’s like the prom in there” Complains that all the prom girls are jammed in the bathroom putting makeup on. Raven says she asked Paul if Dom acting weird and he said 100% she was. Raven – Dom is playing a better game that we realize I think she’s got both sides..
Raven says the best way to get exposure is to make a big game move. Raven says gamewise Dom’s show last night was not smart. Raven says Dom likes to stir up the drama. Matt says if COdy gets the battle back he’ll be going after Mark. Matt says Cody drew Dom right into that conversation. Raven thinks Dom did that on purpose to stir the pot. Didn’t Caleb eat a pickle for a date with Amber? Poor Josh, too bad he didn’t get an awkward date out of the pickle conundrum. Pickle juice is mostly vinegar? Won’t prolong coatings of vinegar destroy the enamel on his teeth? What the fock are you talking about? I’m dentist recommended!! Quite trying to give me a bad rep!! Josh still makes me laugh. He’s an interesting character. I’m glad he stood up to the mean marine. Josh isn’t worldly, or have outside home /life experience yet. He’s like a colt getting his footing. So, Cody should stop picking on someone who’s half his age anyway. Okay, true story… I’m a teacher and I often give my students dill pickles as snacks (I teach middle school). Whenever the jar is empty, I have students who beg for the pickle juice. They make pickle pops with it (freeze the juice in Dixie cups with straws), and I’ve heard that Chik-fil-A actually marinates their chicken in pickle juice which is what gives it that unique juicy flavor. Personally, I love the pickles, but the juice is just too much for me. A middle school with snack time? Do you also have nap time? Pickle Juice works better then Viagra. Yea that was a bit strange, teacher giving kids the pickle and they are begging for the juice. Middle school? Hmmmm Hey teacher leave them kids alone! I read somewhere about Alex and Dom whispering in a room after the show last night and one said something like “is the plan still on”? Then feeds cut immediately.. does anyone know what that was about? They were just confirming their reservations for after the show! Can you accurately quantify that comment? You are simply sharing a personal opinion based off emotion. If you truly want to start a discussion finish that thought with some substance please. We will wait!!!!! You did not tell us how you feel about Andrew and his lap dancing abilities to get such reactions out of the ladies in the profile pictures of the house guests. He’s the winner of BB19. Team Andrew for the win! Cody definitely planted little seeds of doubt & with Mark reacting the way he did, just verified it (Mark speaking up like that during Dom’s show was NOT a good look for him – he looked uber guilty). Mark should’ve just sat there doing what he does best – looking dumb & acted like Cody was talking about someone else. Hope things FINALLY get interesting. There will DEFINITELY be a Battle Back. Simply because Jillian only did a few interviews right after eviction & we haven’t heard from her again since (ie; she’s in sequester). One interview was the after interview with Jeff, the others were directly after eviction given to syndicates like CBS’s partners The Hollywood Reporter & Entertainment weekly. In NONE of those interviews was she told who ACTUALLY voted her out (Kevin & Josh). If she was never potentially coming back, telling her that information wouldn’t make a lick of difference, right?? Each interviewer would want to be the first to get her reaction to that spoiler, but no follow up question or statement is given to Jillian & she still thinks that Alex & Jason were the ones who flipped one her. Nobody, not one interviewer ever told her it was Kevin & Josh. Add all of that to next Friday being a show night & we’re definitely having a battle back (and with hope, Cody will come back & mix things up a bit). I may not agree with his God awful social game, but Cody, Alex & Jason are the ONLY ones who refuse to drink Paul’s Kool-Aid. They are the ONLY hope we have for the rest of this season. One thing I will never understand is why Cody didn’t try to get Ramses to be the target…he is a shady dude to everybody and it could have been done ( by Dr.Will!) instead we got his hurt feelings, his klassy gf playing mind games on him all week, and both of them playing dead. This was no valiant week of BB play. while i do think there will be a battle back, i’m unsure if it was always intended and it might be structured oddly. i don’t think cameron was put in sequester. megan’s clearly gone. so it may be just a “curse” of winner of this week’s evictee vs. jillian reenters. I believe there’s going to be a battle back. When Cameron and Jillian got evicted, especially Jillian because her eviction was live, Julie did not show clips of who voted for who, and no goodbye messages, no questions of ‘who do you think voted you out?’; and those are usually the norms of the show except when they’re planning a battle back. That is why I believe there will be one. Hopefully it will happen soon to keep the game interesting. I hope Christmas is alright. I hope she’s alright too. I also hope she’s not coming back to the game! Why does Josh have to drink pickle juice again? Lost a pool game against Paul. Nothing really happened today.. Feeds were cut for hours as they prepared for the live show. So he doesnt sound like a stupid tard? Looking forward to tonight and rooting for Alex or Kevin to win HOH to watch the house spin off it’s Axis…waiting for real drama. It could be a great, crazy week if Alex won HOH tonight! I have come to the conclusion that either Jason or Jessica need to with the HoH tonight … they are the only two who may be willing to go against Paul & the Floaters. Kevin and Alex would probably nominate Ramses and Jessica to get by another week. Pretty sure most of the floaters would as well with Jason as the backdoor option. Ramses would be so indecisive about it all if he won HoH he would probably nominate himself. Mark and Dom would look good on the block this week with Matt as the backdoor option. Think Alex may get the 3rd Temptation … could be good to save Jason should it come to that. I’m thinking Kevin or Alex gets 3rd. One of those two for sure. Honestly I never liked Cody but this week has soften me. Let’s get rid of Jess and giv him a real shot at this. 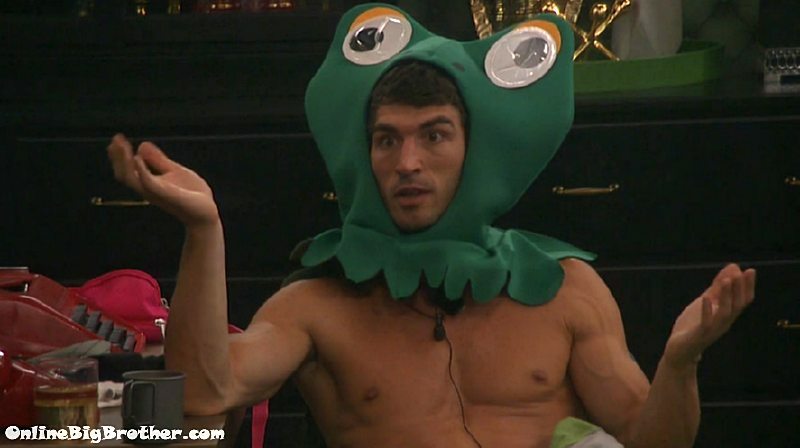 I’m still team Paul but Cody deserves a fighting chance….